CLERMONT-FERRAND, France, September 24, 2018 (ENS) – To the French tire manufacturer Michelin, Ambition 2048 means a whole new strategy of using sustainable materials in tire manufacturing and recycling. It means that in the year 2048 Michelin plans to manufacture its tires using 80 percent sustainable materials, and that 100 percent of those tires will be recycled. Michelin plans to help create a circular economy with a new tire concept called VISION. 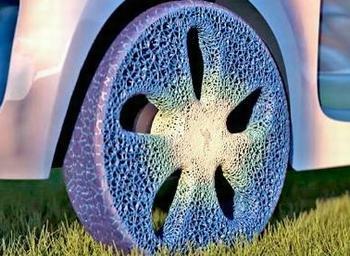 This airless tire would be made of bio-sourced and recycled products with a biodegradable tread that is renewable with a 3D printer. A “connected ecosystem” within the tire, would provide services and advice to the driver. To brainstorm solutions in which tire granulates could be used, a Hackathon was held in 2017, in partnership with Alliapur, the organization that in France manages recycling on behalf of the main tire manufacturers. 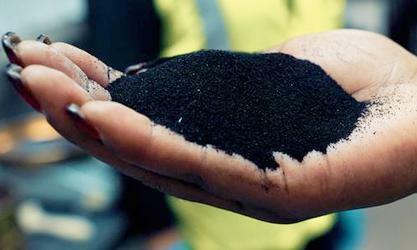 The winner of this Hackathon was Black Pillow, with its idea of creating safe urban furniture made of tire granulates.